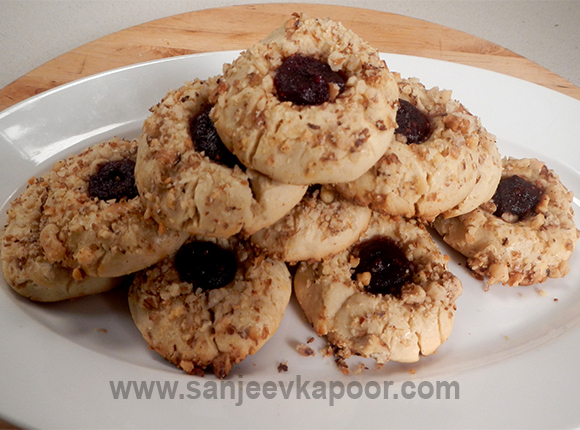 Small cookies with cranberry centres – a sure winner with children and adults alike. Combine powdered brown sugar and butter in a bowl. Beat well with an electric beater till light and creamy. Break egg in a bowl and whisk well. Add half the whisked egg to butter-sugar mixture and beat well. Add vanilla essence and beat again. Heat a non-stick pan. Add cranberries, sugar, lemon rind, lemon juice and some water, mix well and cook till cranberries turn pulpy. Switch off heat and blend into a fine paste using water as required. Divide the dough into equal portions and shape them into small balls. Flatten them into cookies and place them on a baking tray. Make a dent in the centre of each cookie with your thumb. Brush with remaining whisked eggs, sprinkle walnuts and fill the dents with the prepared cranberry paste. Remove from heat, cool and serve.